Coaching with archery is a speciality of mine. It works like this: you take part in an archery session. I tell you what I see. It’s uncomplicated: you place an arrow, open the bow, breath out to let the arrow fly. Anything more complicated that happens, comes from you. This shows behavioural patterns that occur in daily life as well. 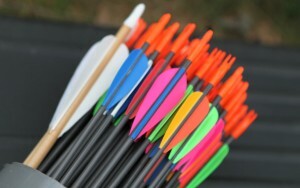 During an archery session we don’t discuss deeply into what is on your mind. This leaves all the more room for you to work on it physically. Consciously or unconsciously. Whatever solutions you find, you take back to your daily life. That makes coaching with archery the right type of coaching if you are not in for long conversations, and want to see robust results fast. Three two-hour sessions deliver lasting results. There is also the possibility to shoot in small groups.